Tonight, a coalition of environment groups led by Beyond Zero Emissions is publicly launching in Adelaide their plan to Repower Port Augusta. Port Augusta Regional Council and power station owner Alinta Energy are backing the plan to replace the polluting brown coal power stations Playford and Northern with a mix of solar thermal power and wind energy. The plan is supported by South Australian campaigners from groups such as Climate Emergency Action Network and the Australian Youth Climate Coalition. The plan has received coverage on the ABC national news site and on ABC Radio’s AM Program. You can download the full report by Beyond Zero Emissions here (pdf). In 2008, I disconnected from coal based power, replaced it with renewables. My comfort levels have gone up, my running costs have gone down, and there are no carbon emissions. It is a simple logic and is readily done. No new untried technologies needed. 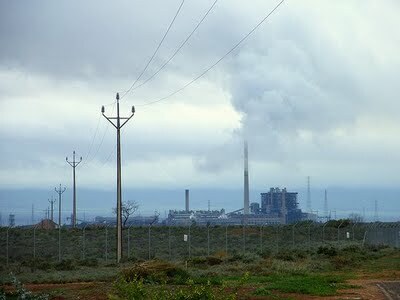 I’m sure most Australians would think that closing down the Thomas Playford power station at Pt Augusta (the dirtiest in Oz in terms of CO2 emissions per MWh generated) and replacing it with renewables would be a wonderful idea. But not the local Federal Liberal MP in the Pt Augusta region (ramblingsdc.net/Australia/RowanRamsey.html) even though there is a huge amount of wind power, existing and proposed, in his electorate.